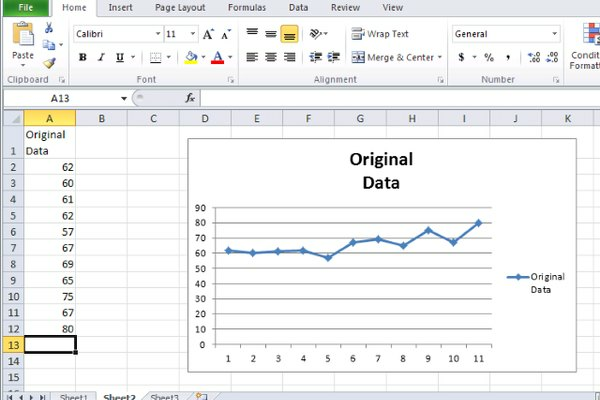 When you create a line chart in Microsoft Excel, your chart may display only a single plot line. It's often helpful, however, to plot two or more lines on the same chart, for example you may have multiple data series that were collected at the same time, or you want to compare data taken at different times. To create an Excel chart with multiple lines, create a new chart with multiple plot lines or add plot lines to an existing chart. 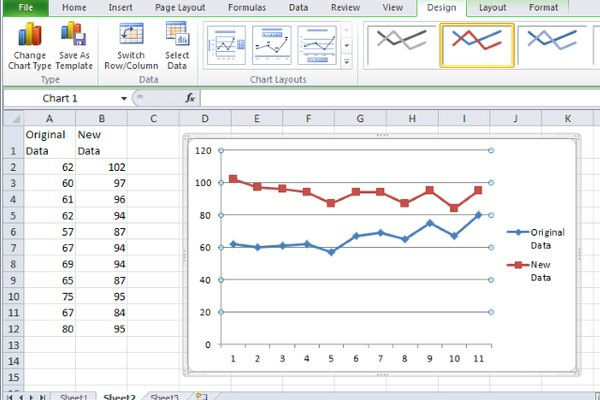 When you create a new chart in Excel, you must specify the data to be plotted (for more information please see How to Make a Line Graph in Microsoft Excel). When you create a line chart using one column of data Excel adds only one plot line to the chart. But when you include two or more columns of data, Excel treats each column as a separate data series and automatically creates separate lines on the chart for the data in each column. If you already have a spreadsheet with data entered into columns, skip to the next step (Create Your Chart, below). 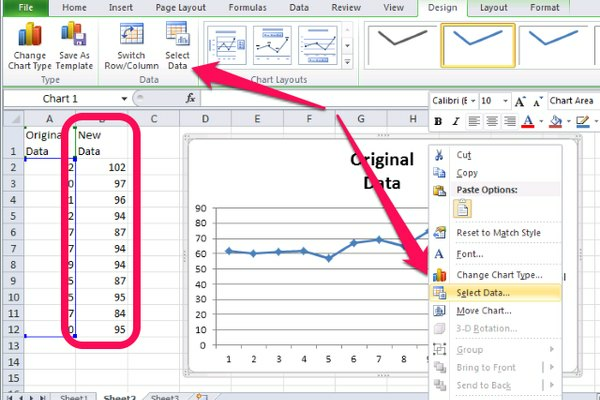 In the first row of the worksheet, enter the labels for each of the data series to plot. Since each data series (the data for each separate line to be plotted) must be in a separate column, you must enter the labels for each data series in a separate column on the first row. Excel uses the labels in the first row of each column to label the lines in the chart for the data in that column. 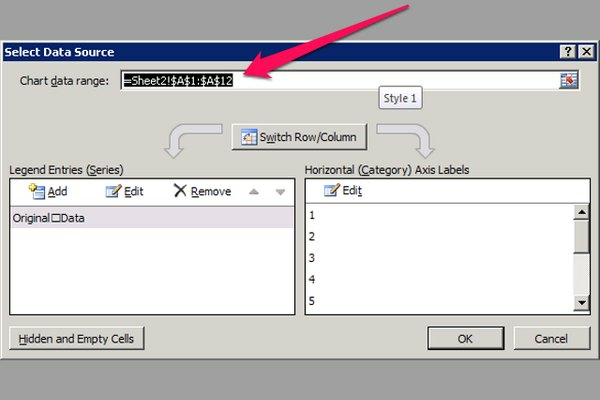 Enter your data into each of your columns, in the rows below the labels. Here's an example worksheet showing two data series. The data for each series is in a separate column, and the label to display on the chart for each is in the first row of each column. 1. Select all the cells in each column that contain your data. If there is at least one empty row and one empty column between the data for your chart and any other data in the worksheet (or if the data for your chart is the only data in the worksheet), you can select all your data cells by selecting any cell of the data and typing Ctrl-A. 2. On the Office Ribbon select the Insert tab, click on Line in the Charts section of the ribbon, and then select the type of chart you want to create. There are multiple types of line charts used for different purposes. If you're unsure what type of line chart to create, select either Line or Line with Markers. Don't worry if it's not right the first time, since you can change it later if you need to. 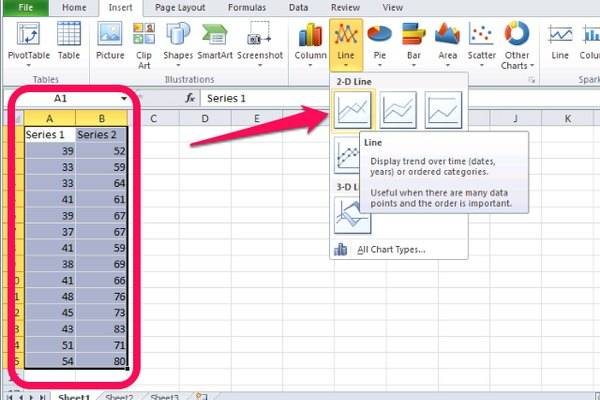 Excel creates a new chart that displays a separate plot line for each column of data. If you already have a line chart, you may add a new plot line to it by editing the Data Source for the chart. 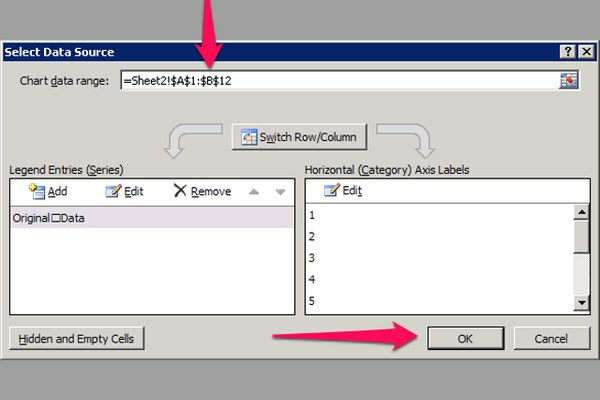 Enter or copy and paste the data for the new plot line into the column immediately to the right of the original data. Make sure to add a label to the first row of the new column so the chart can display a label for the new plot line. Click on the chart that displays the original data to select it. Right-click on the chart and choose Select Data... from the pop-up menu. Alternately, click Select Data from the Data section of the Office Ribbon in the Chart Tools Design tab. The Select Data Source dialog opens. The data displayed in the chart is shown in the Chart data range field. TIP: The dollar signs in the Chart data range field indicate that the field uses absolute cell references. 4. In the Chart data range field, change the last letter of the displayed range, to make it match the letter of the last column of the new data. In the example, the Chart data range displays =Sheet2!$A$1:$A$12, but the new column of data is column $B. So the last A (in the cell reference $A$12) must be changed to a B. The resulting Chart data range displays =Sheet2!$A$1:$B$12. After changing the Chart data range, press the OK button. The chart updates to display an additional plot line for the new data. There are two other ways to include new data in the chart from the Select Data Source dialog. 1. Press the range selection button (the small button on the right side of the Chart data range field that looks like a grid), and then use your mouse to select all the chart data in the worksheet. Make sure to include both the old and new data, and to include the first row of both columns that includes the plot labels. 2. Press the Add icon in the Legend Entries (Series) list. You must then separately type in or select (using the range selection button on each field) only the first row of data in the new columns, and then all the other data in the new columns except the first row.